We are still waiting for solid sea-ice. 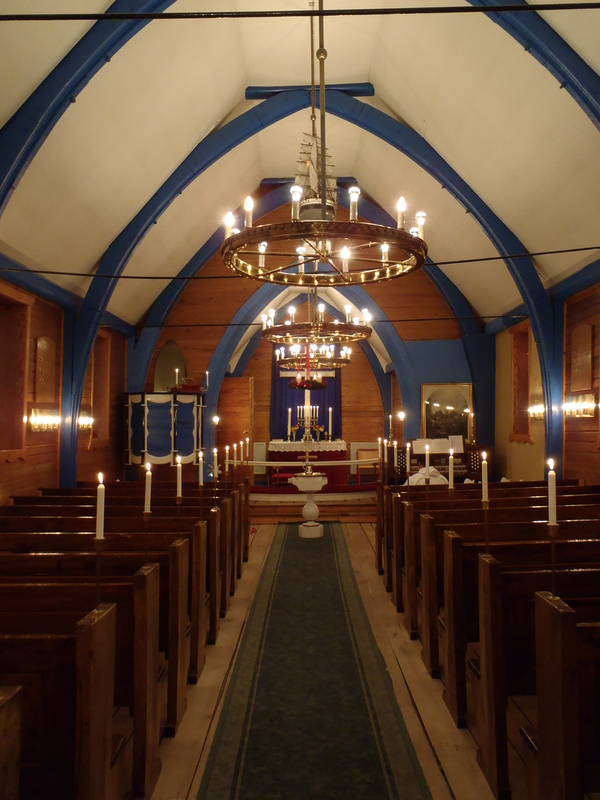 When walking into the church to prepare for the first Christmas service this year, on Christmas Eve, I was reminded of the very first Christmas I spend in Ittoqqortoormiit, in 2004. Back then, I had no idea I would end up spending many years in this place, – and many hours on the bench in front of the organ. I feel excited about the new year, and what opportunities might arise with it! I wish you all a Merry Christmas and a Happy New Year 2017! We visited Ittoqqortoormiit beginning of September 2014 after our Stauning Alper Expedition. It´s always nice to get news from there, seeing how the seasons are changing. Please don´t stop continuing sending beautiful pics from Ittoqq! 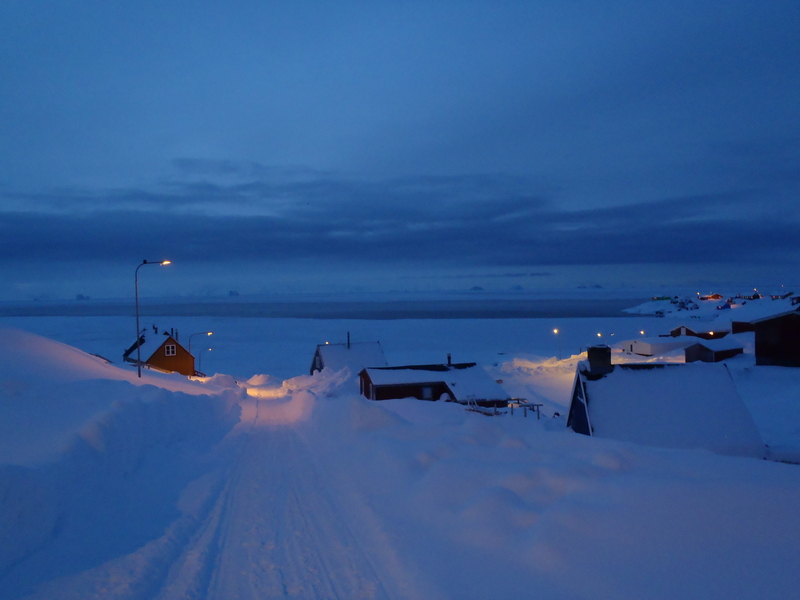 Dear Ruth, thank you for the Christmas impressions from Ittoqqortoormiit! Beautiful pictures. It must be unusual with the open water in December. Does it make hunting easier or more difficult? Dear Jörg, good to hear from you! The unstable ice conditions certainly make hunting more difficult. The hunters were able to go musk-ox hunting in the beginning of december, by snowmobile, since there is plenty of snow. 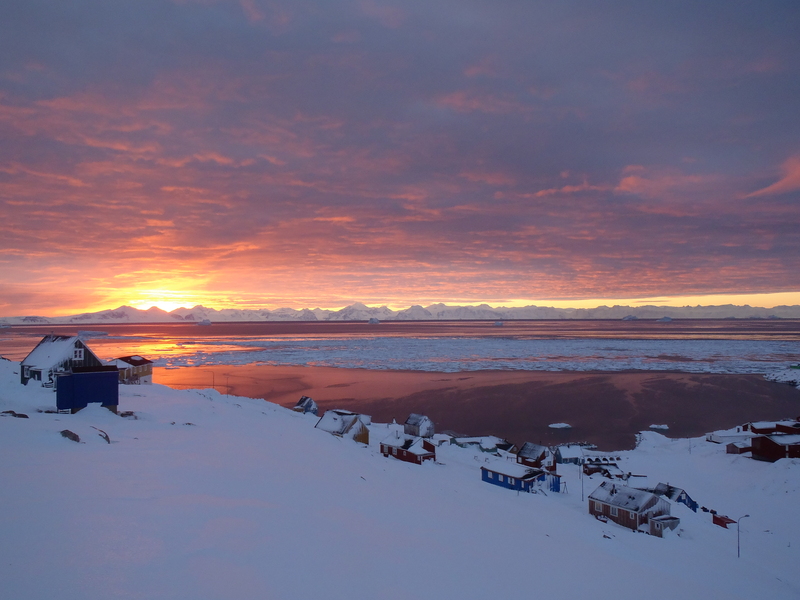 Also, Ingkasi was able to hunt seals from the ice-edge for several days, in the middle of december, before the ice broke of again. Now, there is a thin layer of new ice. – Best wishes for the new year, to you and your family! Since my visit in April, 2016, Ittoqqortoormiit holds a special place in my ❤ Thank you for the Merry Christmas wishes and may your 2017 be filled with joy. Regards and hugs to ALL! Vil bare fortelle at jeg har fulgt denne bloggen med stor interesse en stund nå. Jeg har over lang tid hatt en stor fascinasjon for Grønland. Jeg er læge, og har ved tre tilfeller arbeidet i Paamiut, men har jo også hørt om denne øde byen Ittoqqoortoormiit, og jo mer jeg har sett av bilder (blant annet på din blog) og ikke minst TV-serien til Anders Lund Madsen så har jeg funnet ut at dette er et sted jeg bare må oppleve. Nå har det lykkes meg med dette, og i august 2017 har jeg blitt ansatt i et fem ukers vikariat som Distriktslæge i Ittoqqoortoormitt. Det ser jeg frem til. Hei! Godt å høre at du får mulighed til at arbejde i Ittoqqortoormiit til sommeren! Jeg bodde jo i Norge før jeg flyttet hertil, og vinterturer på bl. andet Hardangervidda gav mig et godt grundlag for å kunne klare mig i den østgrønlandske natur. :-) Jeg kjenner forresten en norsk dame som har arbejdet her i Ittoqqortoormiit, og andre steder i Grønland, og som er i gang med å skrive en bok om Grønland! Jeg håber at du kommer til at trives her i byen! Vi ses til sommeren! Liebe Katharina, vielen Dank für Deine Nachricht!! Es freut mich sehr, von Euch zu hören, und wir freuen uns auch schon auf ein Wiedersehen mit Euch 🙂 Das Wetter war bisher sehr wechselhaft, viele Stürme, doch meistens “nur” für einen Tag oder eine Nacht, doch mehrmals in der Woche. Wir hatten ein schönes Weihnachtsfest. Ich melde mich bald per e-mail ausführlicher. Wir wünschen Euch ein wunderschönes Jahr 2017! Thank you! And I agree, there is incredible beauty in creation, all around us 🙂 even in this harsh environment.